LÀO CAI – The police have identified the murderer responsible for the brutal killing of four members of a family in the northern Lào Cai Province. 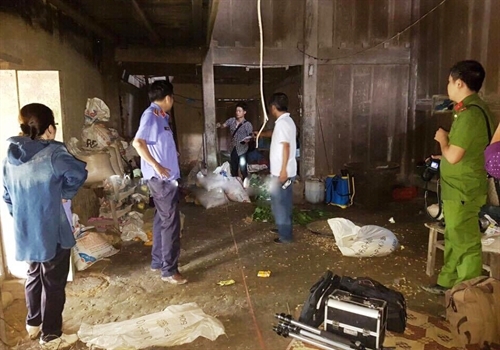 The murderer has been identified as Tẩn Láo Lở, 24, who lived in the same hamlet as the victims, Vice-Director of Lào Cai Police Colonel Hoàng Mạnh Hùng said. According to the victims’ surviving family members, Lở had an affair with one of the victims – 22-year-old Tẩn Tả Mẩy -- even though Lở has a wife and children. After the murder was discovered, Lở was seen going towards the border with China. The killings were discovered on Tuesday evening in Phìn Ngan Hamlet, Trịnh Tường Commune, in Bát Xát District. Robbery was suspected to be the motive at first, as the house had been ransacked and more than VNĐ10 million (US$434) had reportedly been stolen from there. From the scene of the crime, the police seized a hackbut and a stick with some hair strands on it, which were suspected to have belonged to the victims. Tẩn Ông Nải, 22, and his parents returned home at 10pm on Tuesday, after working in a rice field, and found his wife, two daughters and niece murdered. Tẩn Mai Phương, Nải’s 16-year-old niece, was found dead in a nearby stream with rocks piled on her body. Nải’s wife, Tẩn Tả Mẩy, 22, had been drowned in a pond some 100m from the house. His 12-year-old and 20-day-old daughters were found dead in a canal nearby.